The head of the International Monetary Fund, Christine Largarde, said Friday the world economy is entering a “dangerous new phase.” Lagarde is referring to a debt bubble, the likes of which the planet has never seen before, and the possibility that it could all unravel at any moment. Uncertainty over the debt crisis in Europe is what caused the Dow to crash more than 300 points at the end of last week. What is Lagarde going to do about the debt problem? A CNBC story reported, “She warned that both advanced and emerging economies faced key economic challenges, and that governments must ‘act now’ to stop further contagion. ‘Policymakers should stand ready, as needed, to take more action to support the recovery, including through unconventional measures,’ Lagarde said.” (Click here to read the complete CNBC story.) Lagarde is surely talking about revving up the global printing presses for more bailouts. Meanwhile, the Germans are talking about letting countries like Greece go bankrupt. Another CNBC story yesterday said, “Even senior figures in Merkel’s conservative Christian Democrats (CDU) are leaving open the possibility of default. ‘The way things are looking, you can no longer rule out a possible Greek restructuring,’ CDU budget expert Norbert Barthle told Reuters, when asked about a default or euro zone exit.” (Click here for more on this CNBC story.) So which is it? Will it be bailout or default? Who knows, maybe a little of both before it is all over. That “fragile situation” would mean a panic set off by an impending debt implosion, but SocGen’s Grice says the powers will not allow it to happen. In the end, there will be a burst of money printing to stave off insolvency that has already infected many European banks. Then, there is the absurd idea that Europe and America, for that matter, can “grow” their way out of the trillions of dollars of debt the western world has racked up. An Associated Press story on Friday said, “The argument put forth by (Tim) Geithner and others is that the best deficit-reducer is growth: When the economy is humming, it offsets spending and drives down both the size and the proportion of deficits. Rather than trying to scrimp their way back to prosperity, world economies need to spend money to make money.” (Click here for the complete AP story.) The “spending” is code for printing money out of thin air, and “growth” is really code for inflation. It looks like European banks will need some cash long before they can “grow” their way out of the tremendous debt they are in. Just last week, Deutsche Bank CEO Josef Ackermann said, “It is an open secret that numerous European banks would not survive having to revalue sovereign debt held on the banking book at market levels.” There are twenty Federal Reserve primary dealers of Treasury debt around the planet. Do you think the Fed will let a single one fail? I think the “kicking distance” and the “cliff” are somewhere between now and early 2013. They have it so twisted. Lets for all honesty assume Gold was/is the only form of money. Would mining more gold produce more money? Yes, . . . but what would happen when all the gold in the world was mined? Thankfully we can just print money. Printing more money to make more money should not only produce inflation it could trigger exponential inflation because over time its going to start adding up. News Flash – our whole society is unsubstainable. We have scarce resources and according to the law of supply/demand – printing money to acquire these scarce resources is going to produce less supply because of fear of hyper-inflation. Add to the icing on the cake of less supply because of global resource shortages and you have a perfect storm for hyper-inflation and SHTF. If you believe the government is lieing about covering up massive fraud it really makes you wonder what else they have lied about and/or covered up. Greg, printing, printing and more printing is all the Fed and our government knows how to do, so that is what they do, no surprises here. They only hope that the cliff is farther than they envision. All the talk of deficit, spending, U.S. default of last July, etc., and look what was proposed last week, almost 500 billion jobs (tax) plan, which is was in reality just a hybred stimulas program. Just more of the same. As to John Williams at Shadowstats.com timeline, who knows? I don’t think that can kicking is a probable valid timeline evaluation, more likely a “black swan” type event, especially in Europe, a severe winter & spring freeze, earthquake, war or serious revolt of some type. But with the printing in full force and effect a smaller black swan can can make the timeline march quicker into sight. The printing has been and will be global–it will just get worse. Thank you for the comment. Geithner sounds like my get rich quick Brother ” you have to spend money to make money”. If our government is run by that motto we are all doomed. Another great article Mr. Hunter. 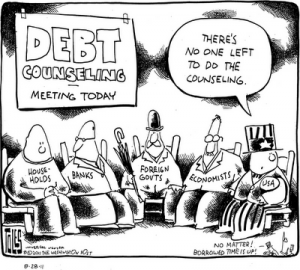 Day after day, keep your hammer banging away to drive home the seriousness of the debt message. What the world today needs is another David [David and Goliath]. Some person among us who is totally focussed on slaying the Debt Monster with a few unconventional ideas. Ron Paul? Thank you for the comment. Ron Paul 2012!! The only honest politician and only one that has a clue about how to fix our economy, cheers to Freedom and Liberty! As usual you’re right on. There are really only two solutions to the debt bubble, outright default or printing lots of money. And we all know politicians won’t support default so we can all look forward to the coming of the $100,000 bill in our wallets. I’m pretty old so the really bad stuff that’s coming won’t be so bad for me, but I really fear for my kids and grandkids. Falling off the cliff in Europe or America? Thank you for the comment and content! like a fart in the wind! dry” for one drop of oil on your garage floor. The “borrow and spend” economy is a bust! I complained about this since 2002 when I noticed that the FED had zero interest rates and the economy was allegdley booming years before the 2008 meltdown. Today, there are very few industrialists like Henry Ford with the vision to realize that his workers needed to make enough money to buy what he produced and his workers needed time off to spend the money they made. I have mentioned this before on this site. And while I type I am listening to Robert Reich and he just started talking about Ford paying his workers three times the nmormal wage. and here is a good story about robo-signing which found the practice went back as far as 1998 which means robo-signing was the standard operations procedure for the banks…..
and I just saw this one involving LPS and robo-signing too….. This is what happens when the elite always win. They cut their taxes and everybody else’s wages so that governments and people have no money. If government can buy/spend and people can’t buy/spend you have no economy. The elites have all the money. They win. Hurrah. Now what? Someone just told me that she listened to an analyst/statistician on CNBC who said the stock market has outperformed gold. if you consider the federal reserve act to be a defacto act of treason, and the case can be easily made, then default is not only a consideration but a constitutional mandate under article four of the fourteenth amendment of the constitution for the united states of america. since all debts accumulated under the auspices of the federal reserve banking system are, by nature and definition, debts incurred by a true attempt to overthrow the constitutional republic of eh u.s.a., they are, by the supreme law of the land, illegal and void. if you can’t get your head around that, then go ahead and buy gold, believe it will somehow save you, and just stay out of the way. time for “WE THE PEOPLE” to step up to the plate. the alternative is completely unacceptable. 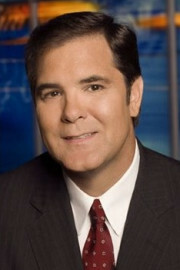 Greg, Martin Armstrong has a great in put about the U.S. & world economies. I think it worth the time for all to read it! http://www.armstrongeconomics.com/writings, 09/08/2011 ‘Bound by the theories of the past’. Have a great day! Thank you M Smith. I really respect Mr. Armstrong!!! Let’s put our thinking cap on. Are all the persons involved in this problem stupid? making stupid comments? Please! Events are taking place as planned. Which family name in Europe (worldwide???) would benefit the most by a Euroland blowup? There’s only one! Cui Bono? 404 on the armstrong link. The longer this stupid game goes on the more likely it is that we will not come out of the inevitable end of this in a condition that anybody with a decent conscience would consider acceptable. In my experience, I find that if the government receives $1.00 in new taxes, they spend $2.75 (example only) and then cry we need to spend more or the world will fall apart. This is Obama’s main theme! Well guess what…it has, financially! As far as “kicking the can” down the road, I believe the can has completely disintegrated! All the debt being placed upon the public, on a world wide basis, can only have one outcome…they will never pay it back. So in essence the problem will go away. I believe debt equalization will be the result and ALL OF US GLOBALLY will start over again. We can only hope the bankers will go out of business and stay that way. The world should shun anyone that states they are a banker. It would take a miracle for these guys to put themselves on a budget. It’s amazing to watch the worlds foolish leaders keep printing money daily to throw on the fire of their global monetary collapse. Even Obama won’t call his latest antic (jobs act) another stimulas package or QE# whatever it is. I don’t like calling people names but the worlds bankers and leaders are a bunch of crazed lunatics. We have to end the FED. Save yourselves from their lunacy. For now buy gold, silver,land and seeds for food and vote for Ron Paul. Buy guns and ammo. Screw the bankers and politicians. I honest to god thought that our next bubble after the housing bubble was going to be a renewable energy bubble to advance us in a better direction. Instead we get a debt bubble fueled by a corrupt private institution. I’m glad Warren Buffet has lost his shirt on BOA so far . . he should have made the more calculated decision and invested in something useful. Instead hes betting BOA is to big to fail. With the ever accelerating disaster scenario that is the Euro zone, trying to keep up with rumor/crisis/solution du jure is enough to leave a strong mind a serious case of confusion (what I call the “they said what?” syndrome) and a weaker one in a state of psychotic dislocation. Just last Friday the rumor of the day was that Greece could default or withdraw from the Euro over the weekend and that German banks were scrambling to put actions in place to cover the losses the German banks would incur. Oh what I would have given to be a fly on the wall hearing the behind the scene conversations at the G7 meeting in Marseille this weekend. Not so remarkably the public statements were long on hyperbole and short on substance. By late Sunday the futures on all the major markets were in the red. By the end of trading in Europe all the markets closed down with the French CAC getting hammered down by over 4%, based on concerns of their exposure to Italian Bonds. It looks like the decision coming out of the G7 meeting was to tell the Greeks with “great firmness” to shut the hell up about possibly defaulting as the bankers had a bigger problem on their hands with the disastrous, nearly bidless Italian Bond auction. With the DJIA continuing to decline the Italians then released a story that they had had discussions with the Chinese requesting they intervene and buy the undesired and undesirable bonds. Whether the almost immediate reversal in the DJIA, with surprise, surprise financials like BofA and Citi leading the way, was actual investor interest or intervention by the FED is yet to be determined, if at all. If I had to bet on that one I know where I would be putting my money. Never mind that the Chinese have not even said if they were going to buy any Italian Bonds, the rumor that they might was just the excuse needed for another manipulative intervention. Never mind that they are presently looking at getting burned on the Portuguese and Greek bonds they have already purchased. More MOPE (management of perception economics) was needed and that’s what we got. I like to think about the global economic situation like one big board game. The major players change the rules at will and will continue to do so until one of them gets the idea they have been taken advantage of and someone turns the board over. A major war is the End Game. I really hope you are wrong but I fear you are dead right. Thank you for the sobering comment. They Said What? …. Again. Well it looks like the Euro zone gurus are trying to stay ahead of the curve. In last night’s post I speculated that the latest MOPE of the Chinese buying Italian bonds would be shown to be bogus before markets opened on Wednesday. Even with the European market up today, feeding off of yesterdays delusion, the ECB may be preparing for the collapse of yesterday’s MOPE by spreading today’s MOPE. Namely that it’s not the Chinese but the Russians who are going to come to the rescue of the European bond market. Apparently even this rumor was not deemed enough to inspire the necessary MOPE as within a few hours it was revised to throw possible Brazilian involvement in the mix in hopes of trying to create some perception of a trend. The half-life on this was pack of lies was made even shorter than expected when the Brazil’s Central Bank policy head Mendes met with the press saying that the “Euro is less important in Brazil international reserves”, and “Brazil seeks reserve currencies with solid fiscal positions.” Oops! Looks like at least one of the prospective victims aren’t in the mood to be associated with the Euro debacle even if only in an unsubstantiated rumor. Seriously “they said what?” After China, then Russia, who’s next, India, Papua New Guinea, or maybe Easter Island? Lord knows they are trying to raise the dead. “We have on many occasions expressed our readiness to extend a helping hand, and our readiness to increase our investment in Europe,” Wen said. At the same time, “they should recognize China’s full market economy status” before the 2016 deadline set by the World Trade Organization. “To show one’s sincerity on this issue a few years ahead of that time is the way a friend treats another friend,” he said. Interesting and a little scary!